The Ojai Vineyard » Dec. 11th – The Scratch Food Truck! 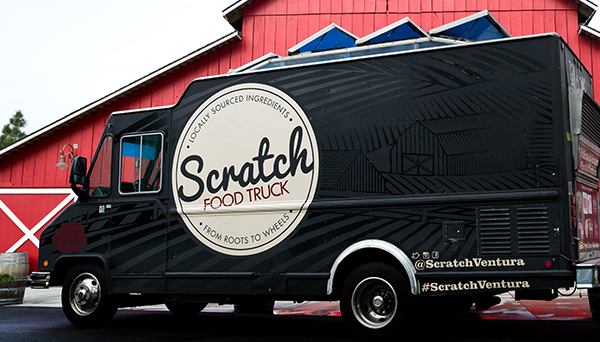 Dec. 11th - The Scratch Food Truck! This Friday December 11th from 5 to 8pm Scratch Food Truck (click to find out more) will be at The Ojai Vineyard Tasting Room to pair their delicious gourmet burgers, salads and soups with our rich and savory wines. We will have live music and the event is open to everyone so please invite your friends! The tasting room becomes a wine bar for the event, and wines for the evening have been specially selected to pair with Scratch’s delectable delights and will be sold by the glass or bottle! Along with a selection of five current wines we will be featuring three library selections of biodynamically grown syrah from Presidio Vineyard—the 2006, 2007 and 2008. There is no cost to attend, just buy a burger, a glass of wine and enjoy! As usual, club members receive their discount on all wine purchased.